Sitting in our backyard recently, sipping after-dinner tea and gazing at the pale sky that settles over our golden California hills on a summer evening, I watched a white bird leave the top of an oak and pause in midair, fluttering his wings. He was “treading” air, as one treads water, in a sense, stationary. 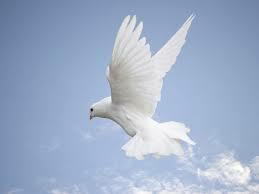 He resumed his flight but soon paused again, fluttering his whiteness into the soft light. Dorothy L. Sayers wrote of the artist as creator in the same way that God is creator. We have minds that reflect our Maker. Our imaginations fly into new realms, pausing to flutter in the air, creating as God creates every second. To see a newborn is to see God’s beauty and goodness. To feel the kick of a child in the womb is to be a part of the miracle of life, a unique and wondrous collection of cells housing a unique and wondrous soul, one born of God’s own fluttering white vision. How precious we are, each and every one of us, from womb to grave, and how loved we are by he who breathed life into us. Someone wrote that we have within us entire ecosystems, and doctors know this as do nurses and others who work with our bodies. The complexity within is staggering in its constant changing, growing, dying, healing. Explorations require innovations. Innovations lead to explorations. The New Horizon spacecraft is presently exploring Pluto and our Solar System. Did we send this craft on its long journey in order to attain power and riches? Perhaps gain does underlie our desire. But more powerful is the impulse, the need, even the compulsion, to explore and map and understand who we are as creatures and the world – the universe – in which we find ourselves living. “We are a species of explorers,” said string theorist Brian Greene, professor of physics at Columbia. “What gets us fired up are unexplored lands…” And of course those new lands are within and without, in language and art as well as geography. Those new lands include interior worlds, sensory worlds, all we think and all we feel and all we sense. We want to explore them all. I agree with Mr. Rothstein and Dr. Greene, but I would go further. Why do we explore? Why do we innovate? Where does this desire come from? Why do we get “fired up”? We are in-spired, breathed upon by God. It is no coincidence that the earliest scientific advances, indeed the very scientific method, came from churchmen, from monks peering through telescopes atop church steeples. Monks cleared the swamps of Europe and advanced agriculture. The impulse to know and to map that knowledge was a religious impulse planted by our Creator, as a reflection of his own impulse to create. But to fly like Icarus too close to the sun is deadly. To disobey God and eat forbidden fruit is deadly. Likewise, science without God is deadly. To fly high is good, inspired by his breath, fluttering in place, pausing to consider moral law and our place in creation. We are creatures of our Creator, and we mirror him. We are destined to create and not destroy, to build and not tear down, to love and not to hate. To fly high, alone, without pausing to reflect, is dangerous. And so it is good to be reminded that the Western world was built on the desire to explore other realms, a desire informed by the goodness and love of God. New Horizons is a product of the mind of the West, the mind of our maker. This entry was posted in Uncategorized and tagged birds, breath of God, creation, exploration, flying, innovation, inspiration, knowledge, New Horizons, Pluto, Solar System, space travel, universe, Western Civilizaton. Bookmark the permalink.